Hello the Forum. I also am having trouble importing data from the CMS50D+ oximeter. I am able to download data using the SpO2 Assistant program. I am able to view the overnight data file. So good so far. Dream station and oximeter were started at same time last night. I get No Oximetery module could parse the given file and next line displays the correct path and file name I selected. SpO2 Assistant program CAN reopen this file and display it. I am stuck using plan 1. OK. plan 2! Download from oximeter to Sleepy Head direct. Lets try that. Not sure what oximeter menu mode is? The user manual is not specific about that or I missed it. Nor do I find where it has command to start data transfer. Not that I missed the menu that allows me to start the recording and turn recording off. I do have an ~8 hour data file from last night. Therefore I can not select upload to commence data transfer. SpO2 Assistant did not require me to select upload to commence data transfer. OK, what's plan 3: HELP! Would someone be so kind as to shed some light on my failed attempts. Please. If it really is a "rights-issue" you can navigate to the folder in the windows explorer --> right click on it --> properties ... there got to the security tab and add yourself to the list (or as you or your usergroup should already be on the list) grant yourself full privileges. what should work too: run sleepyhead with elevated rights (aka run as admin) as the admingroup should have full privileges there by default. My guess is that one of the directories in the path to the file isn't allowing you to read it. Other people seem to be able to use File Explorer to copy the file to a more friendly directory, and then SleepyHead can find and read it. Some day somebody will add better error reporting to this part of SleepyHead. Thanks for the responses. One step closer. Other programs can open the SpO2 file in place. : Notepad++ and wxHexEditor. Interesting. Moved the SpO2 file to another location. Now when I select the SpO2 file I get a new screen. It states IMPORT COMPLETE. 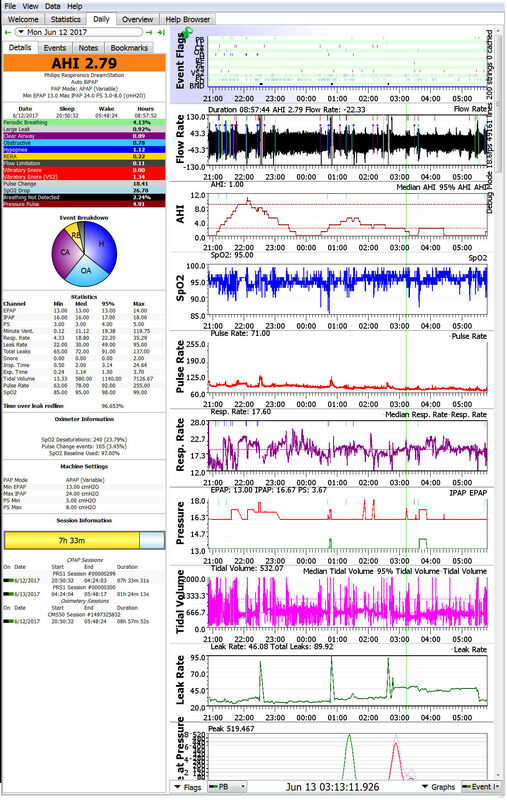 Now I have The sleepy Head session open to the night that I want to add the oximeter data to. I select button that will add at the same time as my cpap session. There is a framework for a calendar. Dropdown box, I set the month June. I set the year 2017. The calendar days do not fill in, I can not select the day of the month. Closer but still not there. Added: I mentioned as an alternative in another thread, I opened/ran Sleepy Head as administrator, but it made no difference, would not open. This is because the CMS50D+ does not have an internal clock, thus the SPO2 file does not have a valid date and time in it. 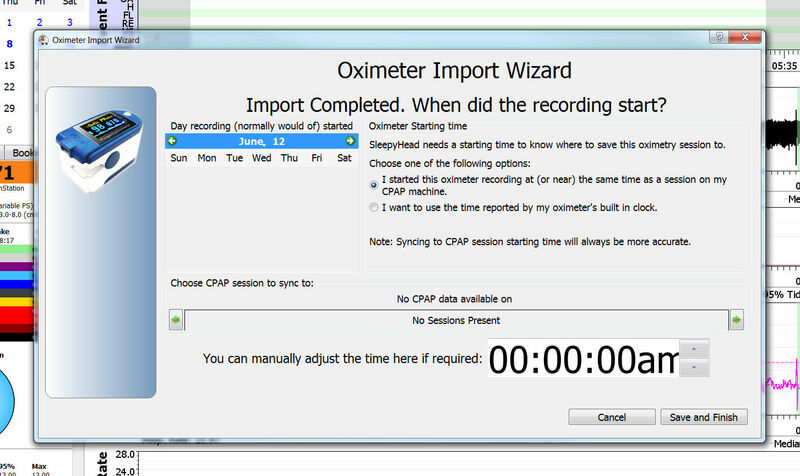 You can try and click the button "I started this oximeter recorder recording at (or Near) the same time as a session on my cpap machine", Set the Month, select the dropdown for day of month, then put the time. Sometimes it will get the correct day sometimes it won't, depending on if you started the session before or after midnight. I'm testing out a SPO2 modifier, so if you want, attach the Spo2 file, tell me the date and start time and I'll change it in the Spo2 file and reattach it and you can test it. Hello Adrenif, please reread my last post. I did use that option, set the month and year, but the days in the calendar box do not fill in!!! So, I did select month and year, but could not select a day of the month. After you select the Month, does it show a ,0 next to it? If yes click it and either type in the day of the month or use the up down arrows to select the date. Like I've mentioned, sometimes it puts it on the correct date, sometimes it doesn't. Sorry to have so much difficulty. Thought it would be good idea to post the screenshot. Here is what I am seeing. I have the month and date. Sleepy Head is saying NO CPAPA DATA AVAILIBLE (on the screen). There is a window below that Which says No Sessions Present. Now I am looking at the session of June 12 2017. This session exists. But I have set it to other dates where sessions exist also. It will not show a session unless you load it with a SPO2 file that has the date and time in it. Go ahead and set the time that you started recording SPO2 data. Click Save and Finish. Check the date under Daily and see if it added the oximetry data. Last night data looks much better than my typical! !